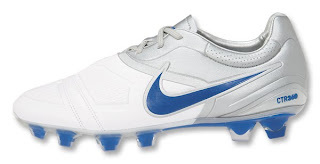 Nike CTR360 Maestri FG Soccer Shoes in white/team royal/metallic silver! ...with Nike's CTR360. Landon Donovan and Cesc Fábregas play vital roles for their clubs. It's their job to organize the attack, distribute the ball and push the tempo when they have opportunities. The Nike CTR360 Maestri Firm Ground Soccer Shoe is designed specifically for playmakers who conduct the attack. The Nike CTR360 Maestri upper consists of revolutionary Kanga-Lite synthetic leather, which mirrors the properties of natural kangaroo leather without the extra weight, plus innovative control pods on the forefoot and instep made of dampening foam deliver excellent first touch, maximum ball control and optimal passing pace. The insole features high performance, molded sockliner with poron low profile cushioning for superb comfort. Finally, the sole of the boot is made up of innovative dual-density forefoot studs that allow enhanced ball-to-cleat interface. Sharper, stronger heel studs lock down the planted foot for better stability.